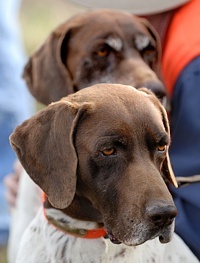 Some shots from this all-breed pointing dog hunt test, held along the Potomac River, in Maryland. The judges and a handler from the day's first brace walk into the bird field behind a master dog. While her gunner eyes a disruptive flock of blackbirds stirred up by a sunny break in the clouds, a handler (with prop gun) cautions her dog to remain steady. A handler and the gunning team (dog, just visible on point to the left) decide how to address a bird. Handlers and gunners chat on their way out of the field after the judges call time's-up. 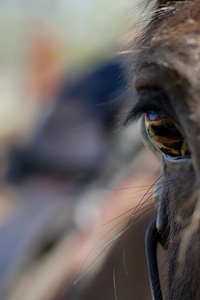 If you've ever been to the McKee-Beshers preserve in the week following any rain, you'll know why the test officials are glad to have horses when they cut between fields. A shorthair watches the bird field from the gallery. This level of concentration (on bird 100 yards away) is just a hint of what's to come in the heat of the test. A judge looks back over his shoulder as a brace of dogs works their way through the bird field's sorghum cover. 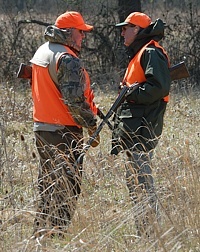 A handler directs a gunner into position. 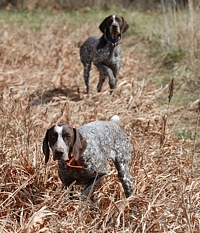 A German Wirehair on retrieve tap-dances past his Weimaraner bracemate. Just off the field, this Weim's being checked by his handler to make sure that a minor scrape near her eye isn't an emergency. This handler's watching the brace of dogs working the bird field. Her two dogs are fixated on the box of quail at the gunner's station. Focused on the bird box, indeed. 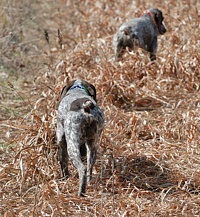 A wirehair stops in his tracks while honoring another dog on point. Pointer, leaving the field with her prize. 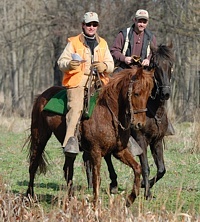 The last brace's scores in hand, the judges ride back to the breakaway to meet the next team of handlers. Never, ever spoil your bird dog. In this case, she's just being lifted up so as to get a better bit of scent from the bird field. You know, because it's, uh, windy, and whatnot. As a handler kicks around in the cover for the bird his Vizsla is pointing, the mounted judge moves in for a better look. The judge watches carefully, the gunner makes ready, and the handler is kicking cover to flush a bird. A gunner lines up on a quail flushing from his right. Note the mounted judge, watching the other dog, to the left. And he does the most important thing a hunt test gunner ever does: he chooses to pull the shot. The judges (who really appreciate not being shot) will make sure the dog gets another try for a retrieve. 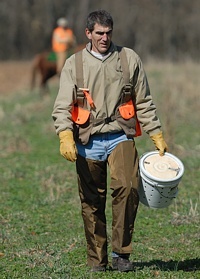 Walking back from the bird field after dispensing quail from the bird bucket. A field events rep from the AKC will sometimes make an appearance at hunt tests, ensuring safe conduct of the event, and providing event officials a chance to learn about rule changes and to get guidance on handler and administrative issues. 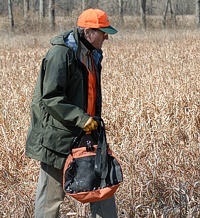 One of the gunning squad heads into the senior bird field with a bag of quail to plant. The test Marshal's horse eyes the gallery area between runs to plant birds on the back course. A handler approaches his pointing Vizsla, barely visible in the cover, as his gunner waits for events to unfold. But the quail flushes straight for the gallery, so the gunner holds his shot. See, blondes do have more fun - they spend cold, windy weekend mornings watching bird dogs work. A young GSP gets a nose full of recently retrieved quail from the bird field. 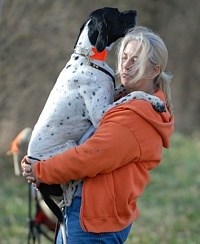 The sights and sounds of a hunt test can broaden a pup's horizons. One more time. Good boy. Nope, not a chew toy. A senior brace, warm in the sun, come around the last bend in the back course, and enter the bird field. Hard-charging, younger dogs are always easy to spot. Oops. Well, back to some stop-to-flush training. Field events can be a great melting pot. A great chance for green dogs to see their counterparts from other breeds and to get more comfortable, socially. And, they're a chance to get re-acquainted with cousins. Over in the Junior Test area, we're treated to the less common sight of a judge on mule-back. 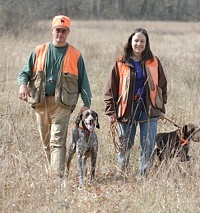 Handler, Weimaraner, and Chukar partridge leave the bird field. A shorthair shows admirable staunchness - he's on point well down the field, and has a bit of a wait for his handler. While handler and steady dog watch, a gunner lines up on a flushing chukar. Dogs passing or not, it's always encouraging to see two handlers come out of the field smiling and chatting. Finally, the sun stays long enough for those on the gunning and bird planting team to get out of the treeline shadows and warm up a bit between braces. A Weim ploughs through the cover. And another, head-high to the wind, comes in from the back course. A handler and his Spinone thank the judges at the end of their run. Still backing, and pointing steadily. Both shorthairs are staunch enough to not mind a photographer stomping around near the bird. Very patient, these two. Incidentally, they're littermates. A hen quail goes for a ride. Quite a ride, in fact. And the ride ends with an intact (if somewhat slobbered on) quail gently placed in the handler's hand. The bracemate is allowed a quick inspection.